Parachutes are used as a recreational activity in schools, daycare centers, and gym programs throughout the country as indoor and outdoor game. 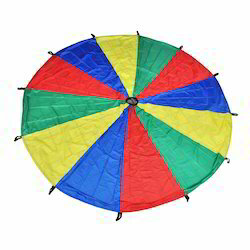 We offer parachutes in many colors and sizes to accommodate all ages and group sizes. Our offered parachutes are offered to customers in varied color combinations for serving diversified demands of customers. If you are looking out for sports and games stores in India, then GSI is the best sports brand to shop. Among sports for Kids and Teenagers, buy this Kids Parachute for fun activity games among kids as part of primary education, for recreation and physical education purposes. Made of Polyester, this Kids Parachute is the best Outdoor sport. As part of this order, you will receive 1 parachute, a carry case (polyster cover in assorted colours), Colours will be Rainbow multicolor pattern with red, yellow, green and blue colors. Adopt a healthy lifestyle and buy GSI's Kids Parachute.